1. How do the gloves work? 3. 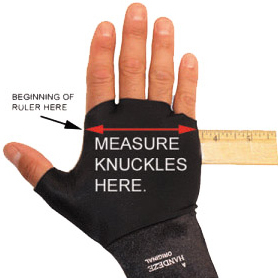 What size glove is right for me? How do the gloves work? The Handeze Support Glove traps your natural body heat, which stimulates blood circulation in wrist, hand and fingers. This reduces swelling and helps maintain flexibility. The form-fitting design provides additional support for the muscles, tendons and ligaments of the hand and wrist. The unique Med-a-Likra process on the four-way stretch fabric provides three main proven pain relievers – HEAT, SUPPORT and MASSAGE. Med-a-Likra is a process of expanding the fibres in the thread after it has been woven or knitted into fabric form. By applying an electrical surge to the fabric, while under compression, the individual fibres compactly spun into each thread are ‘shocked’ apart from one another, creating catacombs throughout the threads. These catacombs, along with the disfigurement of the individual threads, reduce the size of the spacing between each thread and also provide pockets to hold (trap) the user’s natural body heat longer than the same fabric can without the Med-a-Likra process.